The best horror movies (in my opinion) are the horror movies which touch on something visceral, explore those things we, as human beings struggle with, the things which keep us up at night. There are horror movies just about throwing gruesome images at us and that certainly can be popular. But for me to be affected by a scary movie it has to be about characters, their interrelations, there needs to be drama. Good horror requires not only good direction, but good performances. Scary is hard to pull off. A Quiet Place is one of those movies that appears to be about monsters, but is about something else entirely. I'm not talking a Shayamalan twist where we find out a surprise which changes what we are watching. I'm talking about the way the movie uses its blind monster motif to tell a story about how terrifying being a parent is. "What are we if we can't protect them?" asks Emily Blunt's character. Blunt is remarkably strong in this movie giving one of her best performances. The movie's monsters are the world and all the ways the world hurts our children. And the film's story is about the ways we can't save them from it, or perhaps can. Director and star Krasinski handles his first film as a director deftly. I loved the way he introduced his story, then set it up to play out. It is beautiful and simple in its structure while allowing for a subtle complexity to emerge as the story moves on. A Quiet Place feels like the work of a more experienced film maker. And his cast is very much up for the task. As I said, Blunt gives a very powerful performance as does Millicent Simmonds, who follows up her great work in Wonderstruck, with this, showing us she will be a young actor to watch. A Quiet Place is just plain good. Like last year's It Comes at Night or 2016's Don't Breathe, horror about quietness has proven to be a rich source for storytelling. 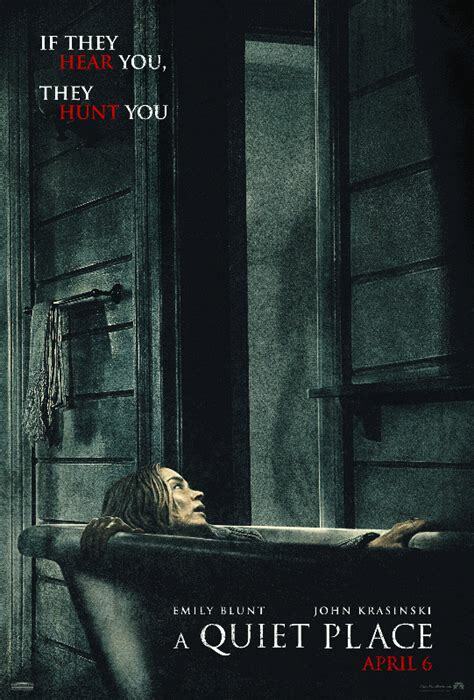 A Quiet Place is riveting, entertaining, moving, and yes frightening. Everything a good horror movie should be.